This entry was posted in Autumn, Nature and tagged Autumn, flowers, Gardening, Nature, Photography. Bookmark the permalink. Went apple picking today – it was a beautiful day to do so, perfect fall weather. Really beautiful – but seems a little early? 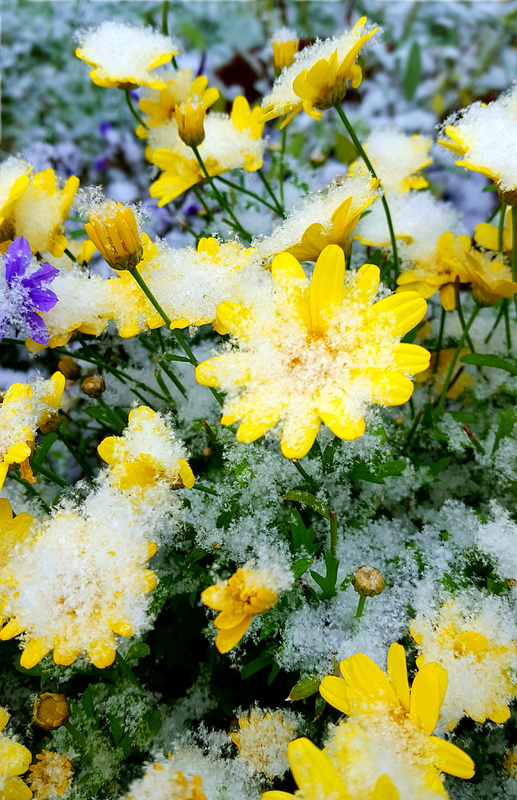 Snow and flowers! So exquisite!! Very beautiful! Thank you for sharing! I grew up with long snowy winters in northern Sweden. I miss the snow a lot now! Right, it is pretty early in the season 😊 it was. I did a double take with this, Julie. It is gorgeous! Thanks so much, Lois! I did a double take myself when I saw snow this morning, wasn’t expecting that at all! Yes, silence here too, but an almost-shriek of surprise seems to be coming from both flower and snow. © Ramblings From Jewels, 2011-2019. Unauthorized use and/or duplication of this material without express and written permission from this blog’s author and/or owner is strictly prohibited. Excerpts and links may be used, provided that full and clear credit is given to Ramblings From Jewels with appropriate and specific direction to the original content.